Centrally located in the heart of Oneroa Village, step out the door to dozens of cafes, shops and restaurants. The library, theatre and cinema are directly across the road. Our guests rave about the convenience of our location! - double bedroom with lovely queen bed and ensuite. - simple kitchen to meet all your needs with bench, sink, microwave and toaster. - full continental breakfast, with home made bread. - complimentary teas, coffee and bickies. - located walking distance to 3 beaches, the white sands of Oneroa beach a 2-3 minute stroll away. - outside area perfect for that before dinner glass of wine. - books and magazines... A selection for reading and exchange. - a few board and card games. - hair dryer and ironing board. - beach towels available on request. The suite is privately situated under the main house with its own entrance and off-street parking. A continental breakfast will be waiting for you to be had at your leisure including; a fresh loaf of home made bread, condiments, cereals, juice, and fresh fruit. Also the perfect location to stay if you are attending a function or Wedding at Mudbrick Vineyard or Cable Bay Vineyard a easy 15-20 minute stroll. Buses to the rest of the island are directly across the road. There are many beautiful walks in the area, coastal and bush trails, walking maps are provided. Leave your car at home as everything is at our door. -Confirm your booking immediately via a Credit Card deposit - it's so easy! Waiheke Island is an awesome place to discover by bike and even better on an electric one that flattens all the hills! Continental breakfast; Cereal, fruit, home made bread, condiments, juice, milk, teas and coffee. Perfect spot. Fresh homemade bread. Lance was just so friendly. 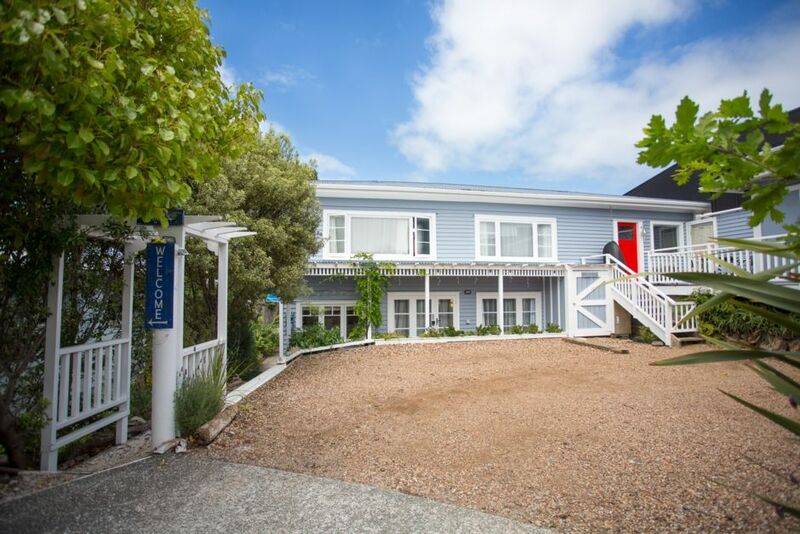 Location is perfect for Oneroa shops, beach, walks and handy to local bus stop to other parts of the island. Thoughtful extra touches of fresh baked bread and some breakfast items provided. The one bedroom unit is clean, cute and cosy. Perfect for the solo traveller as I was. Such a lovely quiet place to relax. Great location and great hosts. We enjoyed our 2 day stay, great location right in the heart of oneora Village. Lance was very helpful with good knowledge of the island, he has 2 electric bike for hire which I thought were fantastic as the island is very hilly, but my wife didn't enjoy the bikes as much as it was slightly too big for her so she didn't feel as safe as she should have but we managed to get round the island. This B&B is the perfect location if you want to be close by the beech, shops and restaurants. The views on the islan£ are stunning and there are many close to this B&B. The owners were really helpful to me during my booking which went wrong not only were they patient , they then sorted for me. They have a wealth of information about the island and were helpful. The accommodation is clean, comfortable and well resourced . The fresh bread is a lovely gesture and having breakfast made it an easy start to the day. I’d stay again. Lance and Emma were very welcoming and perfect hosts. Warm bread on arrival is a lovely touch. However, the bedroom is damp, the clothes I hung up became wet, so unsure about the sheets. Sofa needs replacing as dirty and I could not bring myself to sit on it.